"The True King - Part 2" is the twelfth and final episode of the miniseries Yu-Gi-Oh! Capsule Monsters. The scene starts with King Alexander telling Yami (in control of Yugi's body) that there is no way he can win. Then he orders his front line to attack. Tristan's Shovel Crusher and Tea's Dark Witch are destroyed. Then Joey attacks Reflect Bounder, but his attacks has been reflected and he says "I should have seen that coming". Grandpa's Curse of Dragon and and Tea's Seiyaryu distract two of Alex's followers so Yugi can attack. He attacks with "Chaos Blade" and gets a direct hit on Alexander. But then Alexander attacks with "omni-directional laser assault". Magician of Black Chaos rescues Yugi and he exclaims "Sorry; slight miscalculation on my part". Curse of Dragon then attacks Total Defense Shogun but the attack fails. After telling him that his lust for power would be his downfall, Yami attacks Alexander with Celtic Guardian, Magician of Black Chaos, and Black Luster Soldier. The attack causes Reshef's lasers to turn off. Alexander sacrifices his servants monster, and, in turn, his servants, to release Reshef's full power. The gang's attacks have no effect. Yami tries to get his friends to leave, not wanting them to be hurt any further. They give a speech about how they are in this together, and will never leave their friend's side. 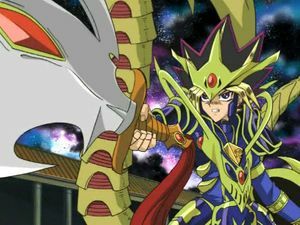 Suddenly, Seiyaryu, Red-Eyes Black Dragon, Curse of Dragon, and Thunder Dragon all combine around Yami, forming the armor of unity. Yami flies at Alexander, energy blasting through him. Alexander is finally defeated, and Yugi turns down the offer for ultimate power. Shadi compliments him on being a true warrior, and they all return home. This page was last edited on 11 November 2016, at 13:48.